e post all new class start date and times on our face book page. So follow us to see when our next classes are running.. Hope to see you there. I offer you and your dog a variety of group classes, workshops, seminars, play groups and privates. I provide a fun and relaxed atmosphere for you and your dog to learn and socialize. 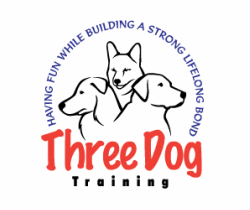 If you would like more information on any of our services you may call​ 1-978-925-9336 or email us at www.threedogtraining@gmail.com. If you call the center during our open hours and get my answering machine, I am really sorry, I may be teaching a class or out of the office doing a private lesson. As of February 15, 2019 We will no longer be taking credit or debit cards for any payment transactions. Cash and check only. Sorry for any inconvenience this may cause. Thank you for all of your continued support, this would not have been possible without you. ​Our new addition to Three Dog Training. Otis, Born February 8, 2018 and came into our lives April 7th.